Leaves surfaces so slick bugs can't stick! Diamondite Crystal Gloss™ Surface Protectant restores the shine and amps up the protection on automotive surfaces cleaned with Diamondite Bug Eraser™ Waterless Bug Remover. Diamondite Crystal Gloss™ Surface Protectant creates a protective, clear coating that has the shine and slickness of a quality wax, yet the convenience of a spray protectant. Diamondite Crystal Gloss™ Surface Protectant restores newly cleaned spots to their pre-bug beauty. After using Diamondite Bug Eraser™ Waterless Bug Remover or any bug remover, paint protection should always be reapplied to the treated area. Diamondite Crystal Gloss™ Surface Protectant makes it easy with a spray-on formula. Made entirely of durable polymers, Diamondite Crystal Gloss™ Surface Protectant leaves the treated surface slick enough to prohibit bugs from sticking to the surface of your vehicle. Surface tension is reduced so bugs can't cling like cement to the paint. When bugs make contact with the vehicle - and they inevitably will - Diamondite Crystal Gloss™ Surface Protectant enables easier cleaning with Diamondite Bug Eraser™ Waterless Bug Remover. Diamondite Crystal Gloss™ Surface Protectant provides a vital barrier between insects and the paint. As bugs break down on the surface of your vehicle, they secrete enzymes capable of etching the paint. It's like a chalk outline at the scene of the crime! But Diamondite Crystal Gloss™ Surface Protectant helps guard your paint finish against these enzymes. Fast removal of bugs is still recommended, but the coating of Diamondite Crystal Gloss™ Surface Protectant will buy you more time before the destructive enzymes reach the paint. 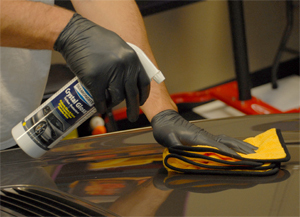 Since bugs affect more than the paint, Diamondite Crystal Gloss™ Surface Protectant works on glass, too. After using Diamondite Bug Eraser™ Waterless Bug Remover, simply clean the glass as you normally would with Diamondite Perfect Vision Glass Cleaner to achieve optimal clarity. Then apply Diamondite Crystal Gloss™ Surface Protectant and buff until clear. The clear polymer formula works as an effective glass sealant, limiting bugs' ability to adhere to the glass in the future. Diamondite Crystal Gloss™ Surface Protectant is formulated to be used after Diamondite Bug Eraser™ Waterless Bug Remover, but it makes a great spray sealant in its own right. Use it for touch-ups to your existing paint protection any time, especially on the leading edges where car wax may diminish faster. To help you remove bugs and protect your vehicle, get the Diamondite Bug Eraser™ Kit. The kit includes three steps to remove bugs, clean glass, and seal and shine the treated area. When bugs strike, clean them up with Diamondite Bug Eraser™ Waterless Bug Remover. Then use Diamondite Crystal Gloss™ Surface Protectant to provide a shiny, slick, bug-resistant coating on auto paint and glass to prevent future bugs from sticking around. For the best results, apply to a cool surface. After cleaning the affected area with Diamondite Bug Eraser ™ Waterless Bug Remover, spray on Diamondite Crystal Gloss™ Surface Protectant. Use a folded microfiber towel to spread the sealant over the treated area. Then flip the towel and buff to a shine.